Givi and Hepco and Becker. bike luggage...I have used a few different makes of luggage over the years. Hepco and Becker: I like the look of the Gobi luggage, panniers easy to carry, topbox and panniers were always watertight. The frames/fixings were solid, but the coatings are rubbish, cracking within weeks and impossible to keep the rust at bay. Same happened with other H&B fixings/frames I had on other bikes. After years of use, the topbox started to crack on the bottom, at the location of resting on the rack, no complaints at it had been on a few bikes for well over 60000 miles. Touratech: on the R1200GSA I had the B_M_W panniers (made by Touratart) and my old H&B topbox, I quickly removed the H&B kit due to the coatings failing and got matching B_M_W topbox and keys. Like most things touratart, very robust and lots of good design features. Only a couple of negative things, the pannier seal on the left side where the exhaust is, was prone to letting in the rain, also the panniers did not have handles, a pain when taking the panniers into shops...which is a good way to save on plastic bags, but primarily to ensure I did not buy too much stuff for the carrying volume on the bike. Frames/fixings were all stainless...no coatings to damage. B_M_W: I had B_M_W panniers on a R1100GS...the pannier at the side of the exhaust would let the water in, also the clam shell design made it tricky loading while the pannier was on the bike. After looking at what is available on the market, while thinking about the future and the possibility of changing or having additional bikesbut keeping he hard luggage, I did a proper review/research and gave a friend's Givi Trekker boxes a good looking at. I liked the 33L and 46L cases, can be used as panniers or topbox. They have a good "clam shell" opening and also a part top opening design. Good looking sealing arrangement. They have handles (handy for shopping with) and the 33L could pass as a briefcase. Also the 33L is not so wide, so should not hamper the filtering that much. The 52L topbox is huge, looks like it will take two larges helmets easily...unlike some that say they can but cannot fit two large full face lids. I have also had two or three normal looking GIVI topboxes which came with bikes, or I bought as used...all did the job at the time with no water ingress. The H&B and Touratart panniers made the bikes very wide, making filtering tricky, hence my current thinking of the slim Gobi panniers and huge topbox and flexibility of combinations. still use a tankbag on my vfr800, but now have a dry bag with bungee loops,.... still getting the hang of packing it correctly /bungee-ing it so it doesn't move too much etc on the seat cowl. Ventura luggage on most bikes until I got my Explorer that came with luggage in the deal. I've got a like new Aero-Spada bag with the storm cover if interested??? You can't beat hard luggage to make the bike truly practical. 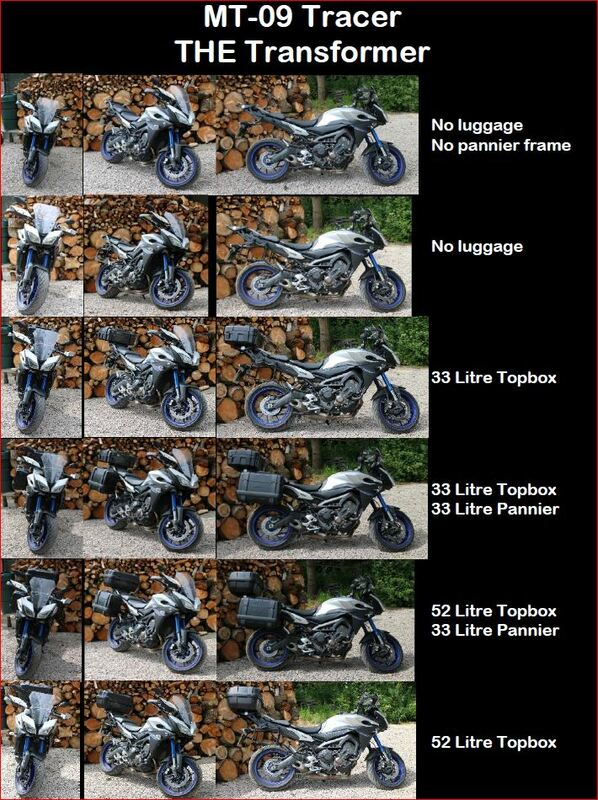 These days, when I am looking at possible future bikes I always check what the options are for fitting hard luggage. If you can't fit hard luggage to the bike or the mounting looks really crap then the bike doesn't make it onto my list. You can't beat hard luggage! Big Kneed Al (master of the emergency stop & "stand up" comedian) wrote: You can't beat hard luggage! The Pan Euro comes with Full Honda Hard luggage Huge amount of space. The RSVR has a top box option ( fitted only when needed) but much nicer than messing about with soft luggage when nipping over to the west coast . Or heading down to Edinburgh with it full of spares . Dave just posted lots of pictures of his wood! Big Kneed Al (master of the emergency stop & "stand up" comedian) wrote: Dave just posted lots of pictures of his wood! I have been lucky enough to get a Kreiga 20ltr tail pack from sunty this year. Its been on my wish list for a long time now. I have to say that out the box I am really impressed with it. My bike seat seemed to come with its own under slung looped canvas fixing points so securely adding and removing the tailback couldn't be easier. The bag is 100% waterproof and looks like it will go the distance too! I had a dry run and managed to stash easily 4/5 days worth of living gear in there (hastily packed too) so your 20l goes a long long way! It also comes with carry straps you can choose to have or not. Kreiga seems well known to most bikers but asking about over the years I dont know anyone who has any of there stuff. The kreiga 20 tail pack can be complimented by 2 further 10ltr on a bolt on / off capacity for extra storage with out having to bodge anything. Well made and clever use of space and mounting..
Gets my vote for anyone in a similar position to myself who doesn't need the permanent solution. Last edited by haiax0 on Fri Dec 28, 2018 11:13 am, edited 1 time in total. I've got the US20, and 2 x US10's that i put on in their various configs depending on what i'm going to be picking up. I also use the US20 with its shoulder strap very regularly for runs to the butcher etc etc. I also have the various waist pack and small US5 with a tank attachment. I've got the US20, and 2 x US10's that i put on in their various configs depending on what i'm going to be picking up. Went away for a weekender with it, one of the US10 for washing kit, one for a pair of trainers and spare gloves. The US10's i put colour coding on so i know which one is which. I was going to see how I got on with the us-20 and strapping on my tent and sleeping back. If I can get away with that the 20lts should be all I need. If not an extra 10 or two will just be the ticket. My bike has quite a small rear tail / sub frame so I can quite quickly run out of space. But yes.. very very impressed with the kriega stuff. Aye, there's flexibility in what you want to do, i have panniers for my bike as well so if i really wanted to load up a lot i've got helmet / gloves / bike / camping stove etc storage in the panniers and could have clothes etc in the US20/10/10 on top of that plus tent on the top of that. Had a right good fettle with my camping gear and what I would deem to need for a weeks riding, camping, cooking and general living and I soon found the Kreiga 20 and two 10's was just not big enough for all my gear. Shame as the 20ltr is an excellent bag for everything else I could want in day to day use (but I didn't want to buy funcy new luggage if I had to lash things back to the outside for camping trips). I have since exchanged for a 30ltr with the two 10's and I am sure its going to be just the ticket. Fingers crossed! I remain still very impressed with the luggage and kreiga have been brilliant to deal with. Ventura rack with Mistral Bag.